The mystical Keris is unique to this region and is its most well known weapon. But the Keris is not alone, the variety and the beauty of local edged weapons makes the Malay World a paradise for old blades collectors. "The Malay armory passes from swords through daggers to knives by stages subtle enough to defy systematic classification. 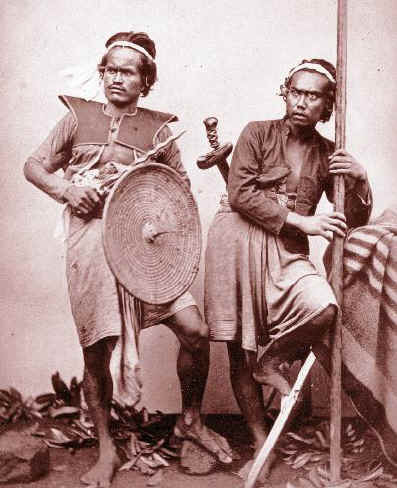 Malays even from the same area disagree among themselves about whether a weapon is a Keris or a Pedang, a Beladau or a Badek, a Klewang or a Golok" A.H. Hill, in the Keris and other Malay Weapons. The fact that little was published about edged weapons other than the Keris, makes it even more thrilling. The collector has to make its own interpretation of the weapon names, which have a different meaning from one area to another.